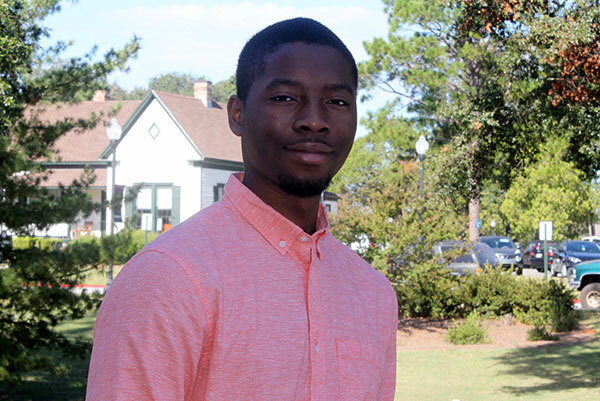 Odell Blackmon III, a dual-enrollment student at MGA's Georgia Academy, is preparing for the world of tech startups. Full Name: Odell Blackmon III. High School: Young Americans Christian School where he has played on the varsity basketball team, run cross country, served as a Student Council representative and tutor, and is a member of the Beta Club and Quiz Bowl team. Family: Mother, Sequetta Blackmon; grandmother, Brendolyn Ray; auntie, Nakkia Ray; sister, Camryn Brutus. Degree Objective: Associate of Science from Middle Georgia State and a Bachelor of Science in Computer Science with a major in Artificial Intelligence from Georgia Tech. Career Goals: "I chose to major in Computer Science because the world is quickly changing to digital solutions. With these new luxuries come new problems that the world has never seen before. I intend on using my degree to aid the world in its transition from the age of information to the age of artificial intelligence." He chose Middle Georgia State University because … "There is a unique opportunity this institution offers on the Cochran Campus: The Georgia Academy. The Georgia Academy is a residential dual- enrollment program that allows ambitious high school students to engage in college courses from as early as the 11th grade. The decision to actually apply to the program was difficult because that meant I would be leaving friends, family, and comfort two years ahead of my peers. Despite my anxieties at the time, I applied and haven't looked back. I would not have wanted to spend my last two years of high school anywhere else." The greatest thing he discovered about Middle Georgia State was … "The wealth of opportunities offered by staff and peers. My expectation of the program was that I would only exist within the Georgia Academy alone. After a few weeks, it became clear that the campus was receptive to all students, traditional or not. The staff expects greatness from their students and rewards those that achieve such heights. The majority of upper-class students I have met have always had my best interests in mind. Many of them, especially my brothers in BOLD, saw potential in me to achieve more than I thought I was capable of doing." His greatest academic experience as a Middle Georgia State student has been … "Sitting through Dr. Lou Bell's English 1102 lectures. Dr. Bell just has a way of presenting what would usually be considered boring information in an interesting and relevant way. She teaches to inspire her students and to change them outside the classroom. The breadth of knowledge that I gained from that class sticks with me even to this day. Thank you Dr. Bell." To him, “greatness” means … "Making your dreams become a reality that everyone else can live and benefit from. The best example that fits this definition would have to be Elon Musk. Musk had a vision of a world full of electric cars that would solve the problems that diesel cars are causing today. Many critics elaborated on how foolish his idea was, how difficult it would be to reshape the automotive industry, and that electric vehicles simply aren't practical. What makes Musk so great even to this day is that he doesn't see the world for what it is, but for what it could be. He is living 5-10 years ahead of everyone else and he is waiting for others to catch up." In five years ... "I see myself working with startup companies and working on side projects. The startup world is like the Wild West, meaning there aren't many rules to govern how a new company should operate. My goal professionally would be to work with these companies and to help them bring their technological ideas into fruition. My personal goal revolves around working on open-source side projects. Open-source side projects interest me because there is a huge community aspect about open-source projects that many people don't consider. The idea of working on a big software project with people from all across the globe to better benefit humanity is what wakes me up in the morning."